The Motorola DTR410™ Digital On-Site Two-Way Radio represents a new and better way for small businesses to communicate, resulting in greater employee and business productivity. 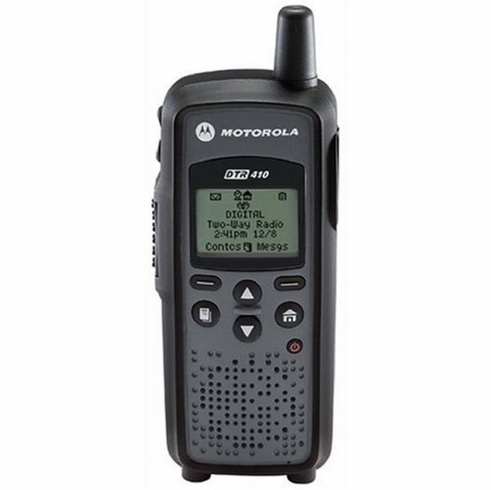 The Motorola DTR410 portable features Enhanced Communication Options such as Digital One-to-Many Public Group Call and recently added one-to-one private calling. These portable Digital On-Site Two-Way Radios provide Enhanced Performance with greater coverage, longer battery life and digital audio quality. Digital.Motorola Digital On-Site Two-Way Radios allow you to take advantage of many leading-edge operational features that were never available previously. Perfect for manufacturing, retail, construction and education. Full-graphic backlit display with contrast adjustment and backlight timer, Daily alarm, Caller ID, Recent call list— last 20 transmissions, Up to 5 group contact list, Unit-to-unit configuration cloning (via optional Cloning Cable), Coverage of up to 300,000 sq. ft. or 25 floors. 1 DTR410 Digital On-Site Two-Way Radio, Standard Capacity Lithium Ion Battery, Drop In Charging Tray, 3-Hr Charger, Swivel Belt Holster, Tri-Lingual User's Guide (CD), Quick Reference Cards.